First generation anti-psychotic drugs such as Thorazine and Haldol are known to increase the risk of heart disease and cardiac death. One of the marketing strategies for the next generation of such drugs has been so successful that three of them, olanzapine, risperidone, and quetiapine, have joined the 10 top-selling drugs worldwide, with $14.5 billion in sales in 2007. These drugs are used for a wide variety of problems, including psychotic symptoms, behavior disorders in children and aggressive behavior in Alzheimer's patients. Chinese medical theory proposes that heart function is affected by many psychiatric disorders, and vice versa, suggesting that caution is in order when a simplistic strategy of suppressing symptoms is pursued with powerful pharmaceuticals which widely alter neurotransmitter and neuroendocrine balances. Modern Western theory regarding the heart is still several centuries behind Oriental perspectives, creating difficulty for physicians who have been unable to understand the connection between psychiatric drugs and unintended side effects, such as altered appetite and weight gain. Conservationists planned to save the birds on Macquarie Island, which is halfway between Australia and Antarctica, by killing 160 feral cats in 2000. However, the result has been an increase in the rabbit population from 4000 in 2000 to 130,000 in 2009. In July of 2008, the FDA considered issueing a “black box” warning about a roughly doubled increased suicide risk for many drugs that are widely used for painful conditions as well as to treat seizure and psychiatric disorders. But, there was concern among the members of the FDA advisory panel that this might inhibit prescriptions, as with the warning “physicians would not prescribe these drugs in certain circumstances where they should". Artist Adam Kuby, has combined Feng Shui with acupuncture by inserting a huge needle into the ground in Portland, Oregon. The artist visualizes the city as a body, locating its energy flows and “needling” areas corresponding to the organs and meridians. Ed. note: We are taking suggestions for where in Cleveland you believe needles should be placed. A study of over 800 adults (466 with non-Hodgkin’s lymphoma, 391 without) has found that a high consumption of vegetables (20+ servings a week) is associated with a 42% reduced risk of developing disease compared with a low consumption (eight or less servings a week). A study of 12 long-term (30 year) practitioners of transcendental meditation (TM) found a 40-50% reduced brain response to experimentally applied pain, compared to 12 healthy controls. A study of 670 men aged between 45 and 86 has found a direct relationship between hostility levels and lung function, and the more hostile they were or became, the more rapid the decline in the lungs. The largest study yet conducted into the relationship between smoking cannabis and developing cancer has found that there is no apparent increase in risk for cancers of the lung, neck, tongue, mouth, throat and esophagus; indeed cannabis may confer some protection against these cancers. Because cannabis smokers inhale more deeply than tobacco smokers and hold the smoke longer in their lungs, and because cannabis tar has 50% higher concentrations of chemicals linked to cancer than tobacco cigarette tar, it was hypothesized that cancer rates would be higher than in tobacco smokers. A study of 101 women (aged 20 to 40), of whom 83 completed the trial, with laparoscopic-proofed endometriosis, randomized them to one of two groups. The first received specific acupuncture for the condition while the other was treated at non-specific points (points with no relation to the diagnosis). A study of 4000 mothers has revealed that children born to couples who have undergone fertility treatment are more likely to be diagnosed with autism, leukemia, brain tumors, cerebral palsy, attention deficit disorder, disorders of sight and hearing and mental retardation. It is not known how much of this increased risk is due to medical problems in the parents, for example diabetes and hypertension, and how much to the fertility treatment. Infertile women also had a greater risk of complications such as pre-term labor, pre-eclampsia, difficult labor and caesarean sections. Their babies were more likely to have low birth weights and more likely to show evidence of poor growth in the womb. (American Association for Reproductive Medicine (ASRM) conference in New Orleans, 2006). Another paper presented at the conference suggests that women born to older others may suffer from reduced fertility, with every year of increased maternal age increasing the risk of infertility in her daughter. A version of turmeric extract similar to the kind found in commercial supplements has been found to be effective in preventing rheumatoid arthritis in animals. CAN AMERICAN PATIENTS AFFORD HEALTH “REFORM”? Sounds familiar. 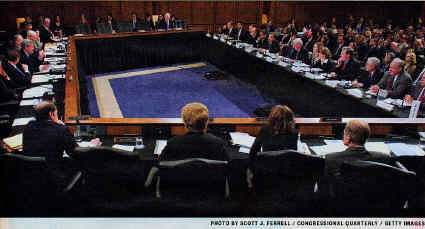 The “experts” and lobbyist groups invited to provide “testimony” at the hearing are all representative of the fat cats who already siphon off untold billions of dollars from citizens in order to return a small percentage to the actual practitioners who provide medical care in the United States. Predictably, patients and practicing physicians and other professionals have no place at the table and will be offered a few crumbs after the banquet to keep them in line. Really. When was the last time that you experienced better quality at a lower price? Especially in a government or third party health “insurance” system? Or any government service, for that matter? Health “reform” will involve new committees, new legislation, and new bureaucrats to administer. A vastly more expansive and expensive government is guaranteed. You can count on lower payments to patients and actual workers, and less coverage for medical conditions. Increased productivity and reducing “waste” is government speak for asking professionals to work for nothing. On the other hand, there will be higher levels of parasitism and rewards to government insiders, lobbyists, and regulatory organizations. This has always been the case when a new part of the economy falls under the baleful and rapacious gaze of the elite classes in Washington. Who will determine what quality the American patient deserves? Well, we all know that from our past experiences with government or third party payment systems. And now, thanks to the American Recovery and Reinvestment Act of 2009 (that 1100 hundred page bill that no one had time to read before it was rushed to a vote with thundering warnings to enact without consideration, or, “consequences will be dire”) we now have the Federal Coordinating Council for Comparative Effectiveness Research. With initial funding of 1.1 billion, this Orwellian bureaucracy will determine how to distill all knowledge and research in medicine into simple terms that will translate into approved and unapproved categories. If you do as they say, you’ll be paid; if not, not. Simple. You may be assured that low cost and effective techniques such as acupuncture or traditional medicines will not have enough “good quality science” to justify the blessing of the Council. Of course, determination of “good quality” will have everything to do with allocating power and money to favored causes and the social agendas of the elite. When there is no evidence available, as is true for most clinical practices, a group of “experts” will be anointed to propose their “consensus opinions” as to what treatments are truly “effective”. A recent example of the efficiency and benefits of “approved” care from my own practice is the recent arrival of a gentleman who has had chest pain for the past 6 months. His primary care doctor was forced out of business by the extortionist prices for malpractice insurance demanded for those of us who wish to practice in Cuyahoga County, so when the pain became so intense that he couldn’t stand it anymore; he tightened a belt around his chest and went to a prestigious local emergency room. Six hours of expensive tests and analysis later, he was told that they could find no reason for his pain, that maybe he should try some Tylenol®, and that he should seek out treatment from the primary care doctor that he no longer had. The pain was so intense, ranging from 5 to 9.5 out of 10, that he determined to do something radical and called me. After the usual preliminaries, it took me about 3 minutes to determine the source of his pain. It took less than a minute to reduce his pain to zero. There were other issues that had to be addressed, but he left after a one hour visit actually laughing about the fact that he was, for the first time in six months, feeling no pain. And, for less than one tenth the cost and, essentially, no risk. This gentlemen had a CD-ROM of the CT scan that was done at the emergency department in his truck. He asked me if I would like to see it. Absolutely, I said, as I knew from my exam and the results of his treatment where to look in the study. Even though I don’t require millions of dollars of equipment to make a diagnosis, I appreciate the ingenuity of these gadgets. Booting up the study on my office computer that evening, however, I found that the study has been ordered for an area of the patient’s body that is nowhere near where the problem is. Whoops. Thousands of dollars wasted and exposure to radiation for no benefit. At the ED the doctors had offered to admit him and perform even more expensive and dangerous tests, but he wisely refused. I am sure that hospitalization would have been “approved” and the tens of thousands of dollars of charges would be considered “state of the art”. Maybe they would have eventually found the problem. Even a broken clock is correct twice a day.